Cyber:Secured Forum delivers two days of in-depth content on cybersecurity trends and best practices related to the delivery of physical security systems and other integrated systems. 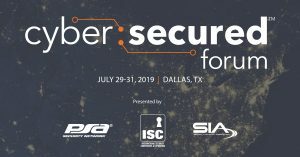 Collaboratively developed by SIA and PSA Security Network’s education teams, sessions will feature top cybersecurity leaders, while sponsor exhibits will showcase solutions related to cybersecurity, integrated systems and physical security solutions. This event will provide leaders in the IT and physical security industries ample opportunities to connect and share information on risks and liabilities, responding to cybersecurity threats, and establishing security control standards across IT systems and particularly when integrating physical security solutions and devices on IT networks.